William (Billy) M. Cunningham, Esq. has over thirty years of experience and success representing both individual and business clients in civil litigation matters. His practice involves personal injury, wrongful death, nursing home abuse, business litigation, environmental law and insurance matters. Mr. Cunningham is licensed to practice in the state and Federal courts of Alabama and Mississippi, as well as the U.S. Court of Military Appeals, U.S. Court of Appeals for the Fifth Circuit and the Supreme Court of the United States. He has represented the 13th Judicial Circuit as a Bar Commissioner, served on the State Bar Disciplinary Panel and is a member of the Board of Directors for Legal Services Alabama. After graduating from the University of the South, Sewanee, Tennessee, he was commissioned as a Second Lieutenant in the U.S. Marine Corps. He subsequently attended Cumberland School of Law in Birmingham, Alabama. After graduation in 1974, he returned to active duty for four years. He resigned his commission and was discharged in 1978. He returned to Mobile and joined the law firm of Sintz, Pike, Campbell & Duke. 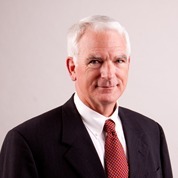 Mr. Cunningham has served on numerous civic boards and organizations. He is actively involved with the Cpl. Joseph Whitehead Detachment #1370 of the Marine Corps League, Gulf Shores, Alabama where is serves as the Judge Advocate.